Wichita Presbyterian Manor will hold its annual Art is Ageless® exhibit March 15 – 30, 2019, from 9 a.m. to 8 p.m. Entries of artists works are from area artists who are 65 years or older. Local competition winners will be featured in Wichita Presbyterian Manor’s newsletter and website, WichitaPresbyterianManor.org, as well as the Art is Ageless website. Manor of the Plains will hold its annual Art is Ageless® exhibit March 18 to 20, 2019 from 9 a.m. to 5 p.m. Entries of artists works are from area artists who are 65 years or older. Local competition winners will be featured in Manor of the Plains newsletter and website, ManorofthePlains.org, as well as the Art is Ageless website. Rolla Presbyterian Manor will hold its annual Art is Ageless® exhibit March 18 through 21, 2019, from 9 a.m. to 4:30 p.m. Entries of artists works are from area artists who are 65 years or older. Local competition winners will be featured in Rolla Presbyterian Manor’s newsletter and website, RollaPresbyterianManor.org, as well as the Art is Ageless website. Click here for more information. 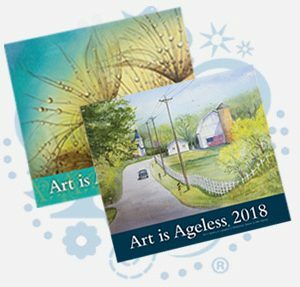 Newton Presbyterian Manor will hold its annual Art is Ageless® exhibit from March 21 – April 5, 2019, 8 a.m. – 5 p.m. Entries of artists works are from area artists who are 65 years or older. Local competition winners will be featured in Newton Presbyterian Manor’s newsletter and website, NewtonPresbyterianManor.org, as well as the Art is Ageless website. Entries of artistic works will be accepted from any area artist who is 65 years or older. The deadline for entries is March 22, 2019. Entries must be delivered to the 2nd Floor Rotunda at Topeka Presbyterian Manor, 4712 SW Sixth, Topeka, KS 66606. Entries of artistic works will be accepted from any area artist who is 65 years or older. The deadline for entries is March 25, 2019. Artwork may be dropped off Mar. 18 – 25, 2019. Entries must be delivered to Fort Scott Village, 2401 S. Horton, Fort Scott, KS 66701. Contact Becky Kellum for more information, 620-223-5550. Entries of artistic works will be accepted from any area artist who is 65 years or older. The deadline for entries is March 25, 2019. Entries must be delivered to the Village Green Commons at Aberdeen Village, 17500 West 119th Street, Olathe, KS 66061. Contact Stephanie Oehlert for more information, 913-599-6100.